This is an article about discovery. Or rather, it’s about how you can set out to study something, and end up on a totally different path. Writing is a lot like scientific research that way. Often, a side effect of some experiment becomes more important than what you set out to study. In my case, I was totally pumped to talk to you about Gun.Smoke. It’s a classic scroll shooter from Capcom (are you sensing a theme here)? In the game, you are a lone bounty hunter who sets out to eliminate the Wingates, a gang of ruthless outlaws, and save the town of Hicksville. The game’s title and premise may bring to mind memories of the classic radio serial and television series of the same name. The television series ran for twenty seasons, and is often lauded as one of the greatest television shows of all time. As usual, in preparation for this article, I did some reasearch on the show. That’s when things got weird. As writers, we draw from classic texts to inform and enhance our own work. After the Bible, no story is referenced or alluded to more than The Odyssey. It was basically the first adventure story of the western world, and it has informed every adventure story that has come since. Although these texts were pivotal in the development of humankind, and they contain a vast reservoir of literary references, their lexicons are somewhat modest. The Bible is 750,000 words long, but contains only 14,500 unique words. James Joyce’s Ulysses, by comparison, is a third that long, but contains more than twice as many unique words. Joyce’s masterpiece contains hundreds of references to the Bible and The Odyssey. And even today writers are still relying heavily on these early entries to the canon. It almost seems that by virtue of being first, these ancient texts have formed the building blocks of all western literature. Just so with the video game Gun.Smoke. Early video games adopted a language of sorts, a pattern of icons and behaviors that became canonized, and still is the default setting for games almost thirty years later. The power ups you gain and the enemies you fight both fit patterns that still echo in modern games today. In Gun.Smoke you gain money by killing bandits and collecting bags of loot. 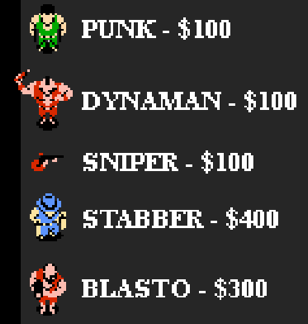 Then, in the middle of levels, you can go to shops where you can spend this cash on more powerful weapons than your regular single-shot default. There’s the shotgun, which dispenses a weak blast at short range but with a wide range of fire. There’s the machine gun, which has a narrow stream but an incredibly fast rate of fire. And then there’s the magnum, which has an incredibly slow rate of fire but will knock out any regular enemy in one hit. There’s also the smart bomb, which you can only use once but will instantly kill every enemy on the screen. Does this sound like any video games you’ve played? If you said “All of them,” you’d be absolutely right! There’s something about this fast/slow/wide/narrow/nuke line up that makes players feel like they have a real choice in how they approach any situation. And as we know, video games are merely a series of interesting choices. Call of Duty, Bastion, Mass Effect, they all utilize similar types of weapons to give players that feeling of customization. Now take a look at the bad guys in Gun.Smoke. Affectionately called “mooks” in TVTropes terms, these are the endless waves of disposable baddies featured in pretty much every video game. These villains also fall into a few distinct types. Take a look at them below. Courtesy of GameFaqs, these are some of the mooks you fight in Gun.Smoke. You have the Punk, the most easily defeated enemy who isn’t much of a threat by himself, but if several of them attack you at once, it gets pretty hairy. The Dynaman is your heavy, who doesn’t make many attacks, but his attacks are deadly. He throws bombs. The sniper is a static enemy – he doesn’t move – but he is hard to hit. The Stabber attacks with melee weapons. He rarely attacks you directly, but he is very difficult to kill. Then there’s Blasto, the machine gun-wielding mook who is one of the more advanced enemies. He’s hard to kill and very dangerous. You see enemies pop up like this in most shooters, particularly games like Time Crisis and MMOs. These video game conventions were established early in gaming’s history, but they persist to this day, similarly to the way that contemporary novels emulate the greats of the western canon. It’s why games like Portal are so refreshing, because they turn away from these gun and goon conventions. 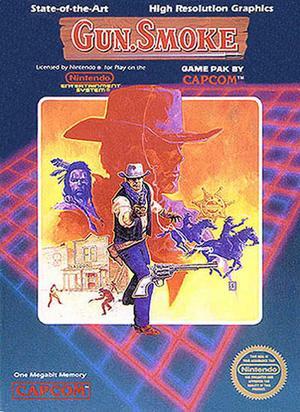 But there is something comforting about the familiarity the widespread influences early classics like Gun.Smoke have had on decades of video games. This entry was posted in 8-bit, game, NES and tagged Band of Brothers, Bastion, Call of Duty, Gun.Smoke, Gunsmoke, Iliad, John Adams, Mass Effect, Odyssey, Quantum Leap, Sopranos, Star Trek, The Wire, Time Crisis, Ulysses, Voyager by Matt. Bookmark the permalink.